Between 2006 and 2007 Siemens built 16 narrow gauge (1000 mm) locomotives for the Vietnamese Railways (VNR), which the Asian operator ordered in 2004. Siemens calls this product the AsiaRunner. The locos built for VNR have a Co'Co'-de axle configuration, which gives them their low axle loads. These low axle loads are needed to run safely on the available infrastructure, which oftenly is of poor quality. The AsiaRunner as a product is related to the EuroRunner, but is designed for services in Southeast Asia and Africa on narrow gauge railway lines. Siemens offers two subtypes: the AR15 and the AR20. The locos built for Vietnam represent the AR15 subtype and have a power output of 1500 kW. 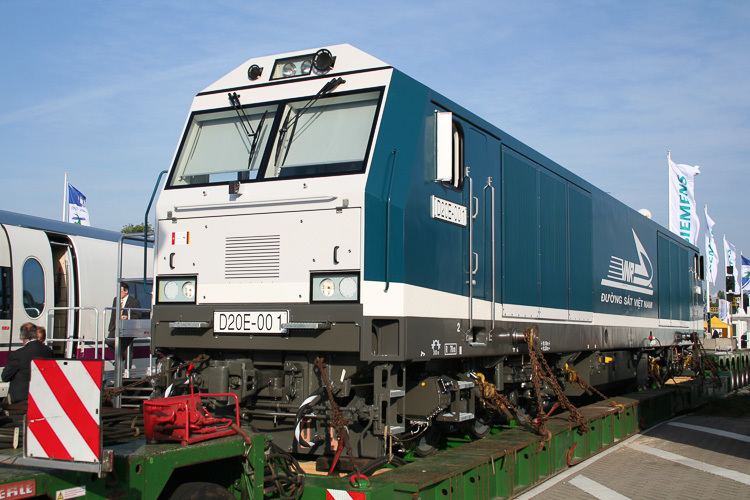 AR20 locomotives are stronger with their power output of 2000 kW and heavier. However, no AR20 locos have been built up till now (04.2013), which makes the VNR D20E series the sole representive of the AsiaRunner locomotive type. Later, Siemens offered a stronger version as replacement of the AR20 concept: the AR24. Instead of 2000 kW engine, this locomotive would feature a 2400 kW engine. However, no examples of the AR24 type have actually been built. Diesel engine type 12V 4000 R41 ?